Brought together by chance as teenagers at Turning Winds, a home for girls, Nora, Ozzie, Monica, and Grace quickly bond over their troubled pasts and form their own family, which they dub The Invisibles. With a fierce loyalty to each other, the girls feel that they can overcome any obstacle thrown their way. Though the walls they’ve built around themselves to keep out the rest of the world are thick, they discover one night, when tragedy strikes, that there are cracks in their tight-knit circle. While Ozzie, Monica, and Grace leave after graduation to forge a fresh start, Nora decides to stay behind in Willow Grove. Now, fifteen years later, she’s content living a quiet, single life working in the local library and collecting “first lines”—her favorite opening lines from novels. But when Ozzie calls out of the blue to let her know Grace has attempted suicide and is desperate for them to reconvene, Nora is torn between elation at seeing the women who were once her most cherished, trusted friends and anxiety over the unresolved conflicts that will most certainly surface. First and foremost, I haven’t finished this book as it’s arrival to me was delayed, therefore, my review will not be as complete as I’d like it to be. What I can say is that I’m thoroughly enjoying this book. The characters, all flawed and completely human, are beautifully constructed, full and relateable. I’ve not met all the characters yet, but I have faith that Galante has taken as much care with the others as she has with the main four girls. Galante also has a great capacity for description. As she describes a place, she does well in bringing about the emotional connection that each character has with that specific place. Each chapter rolls into the next, and Galante creates clean transitions between the present and flashback. What she also does well is create a sense of suspense. From the very beginning, a nagging sense of suspense was intertwined into the life of the narrator, Nora. This, along with the immediate connection I found with Nora and the artful prose kept me reading well into the night despite my need to rise early. These, are my favorite kind of books. As I continue to read on, I’m excited to learn more about the characters and about their flaws. So far, I recommend this one. 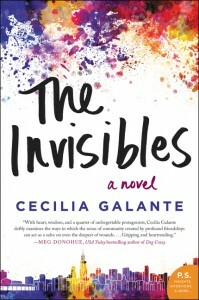 Cecilia Galante is the author of three young adult novels, three middle-grade books, and a children’s chapter-book series. She is the recipient of many awards, including a NAIBA Book of the Year and an Oprah’s Teen Read Selection for her first novel, The Patron Saint of Butterflies. Her books have been translated into Japanese, Turkish, and Polish. Find out more about Cecilia at her website, and connect with her on Facebook andTwitter. The publisher sent me two extra copies of this book, so it’s time for a giveaway! If you’d like to be entered into the giveaway, please fill out the form below. Winners will be selected at random on Friday, August 21st and announced on my Twitter, Instagram, and Facebook so make sure to follow me. Winner will receive one, brand new paperback copy of The Invisibles. Good Luck! Congratulations to Kara S and Natasha A! You’ve each won a copy of The Invisibles. Look for an email from me for more info! I hope you continue to enjoy this book all the way through the end! Thanks for being a part of the tour.